With more than 34 years of experience in the industry, RLE Technologies is a leading provider of water leak detection systems, web-based monitoring solutions, and raised floor airflow management products for mission-critical facilities. All of RLE’s sensing cables and a vast majority of the core product line are manufactured and assembled in the USA. We proudly provide personalized, knowledgeable customer service and support for all of our products. RLE Products are used widely in the telecommunications, colocation, IT, scientific, education, healthcare, real estate, military, government, public utility, financial services, and entertainment industries. Triad is a full supplier of airflow management products for raised floor data centers. Triad’s portfolio includes their patented Chamfer and Slotted perforated floor tiles, a cast aluminum tile, the HotSpotr intelligent air mover, and a variety of other tiles to meet all your raised floor and air management needs. Triad’s perforated airflow panels are specifically designed using advanced CFD modeling techniques to provide higher performance results than any other perforated floor tile on the market, and have been shown to reduce data center cooling power needs by up to 40% while simultaneously delivering superior IT cooling capabilities. Around these high performance airflow panels, Triad has built an entire line of air management solutions providing customers with a single source for all their data center air management needs. Seahawk leak detection equipment detects and annunciates the presence of any conductive fluid. Our patented leak detection cable, used along with our distance-read and zone leak detection controllers, are reliable, scalable solutions that mitigate the potential for costly business outages and downtime in facilities worldwide. Having trouble obtaining leak detection controllers? All RLE controllers are in stock and ready to ship! Contact us for pricing and immediate shipping. Falcon facility monitoring devices provide oversight into the environmental conditions and infrastructure components of any facility. RLE’s units feature an integrated UI that allow them to excel as a stand-alone monitoring devices, but they are also engineered to communicate via protocol integration with BMS and DCiM systems to provide a single pane of glass view of the conditions of a facility’s environment and its infrastructure equipment. If you're looking for a wireless solution, RLE’s WiNG wireless platform is a step above the competition. WiNG sensors have up to a 12 year battery life, a transmission range up to 600’, 98% packet transmission success, protocol integration into BMS/DCiM product, no additional required software or recurring costs, and a very appealing price point. A growing selection of sensors is available to meet your wireless monitoring needs. Raptor Integration Solutions simplify signal convergence and alarm annunciation. They easily integrate into existing management and monitoring systems to provide enhanced visibility of critical equipment and environmental conditions. RLE's UL508a certification allows us to engineer and manufacture custom annunciation panels and certify the panels we create under the UL label. 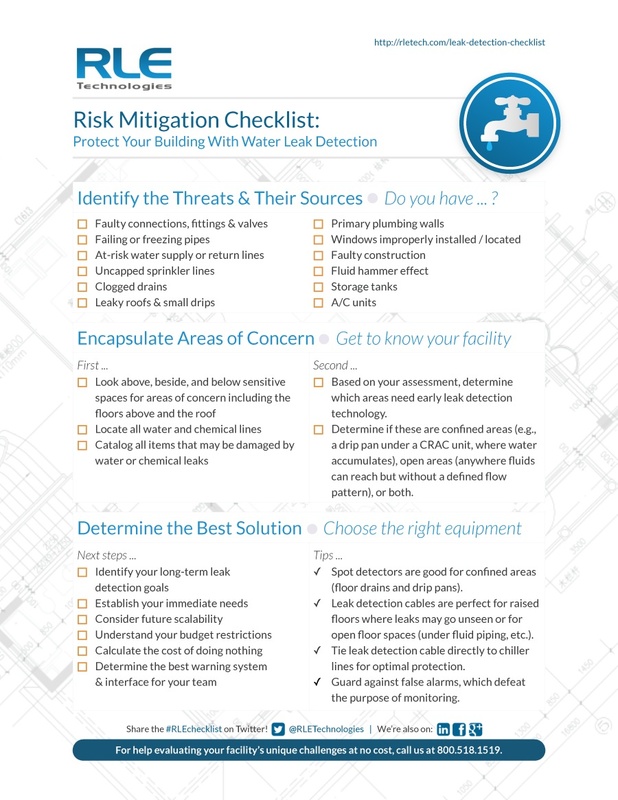 This checklist will help you identify threats and problem areas in your facility, consider your best solutions, and be proactive in averting a disaster before it happens.